Slice off the base and top of the endive. Pluck the leaves, finely slicing the lower parts, and set aside. Halve the cherries, remove the pits, and set aside. Add sugar to a pot and caramelize over medium heat. Halve and juice lemon. Add cherry juice, port wine, crème de cassis, balsamic vinegar, and lemon juice. Peel and crush garlic and add to the pot together with the bay leaf and whole rosemary sprigs. Allow the sauce to reduce over medium-low heat. Preheat the oven to 160°C/320°F. Salt pork tenderloin on both sides. Heat vegetable oil in a frying pan set over medium-high heat and sear pork on both sides for approx. 2 – 3 min. Remove pork from frying pan and transfer to a baking dish. Transfer to the oven and bake for approx. 5 min. at 160°C/320°F. Meanwhile, remove bay leaf, rosemary, and crushed garlic cloves from the sauce. Add butter, salt, pepper, and cherries and stir to combine. Season endive with some salt and mix with olive oil. Remove pork from the oven. Slice pork and season with salt and pepper. 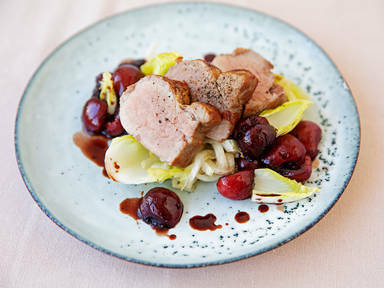 Serve with endive and cherry sauce. Enjoy!